It has become a bit of a pattern these holidays. My kids are complete water babies and the beast has to be fed. 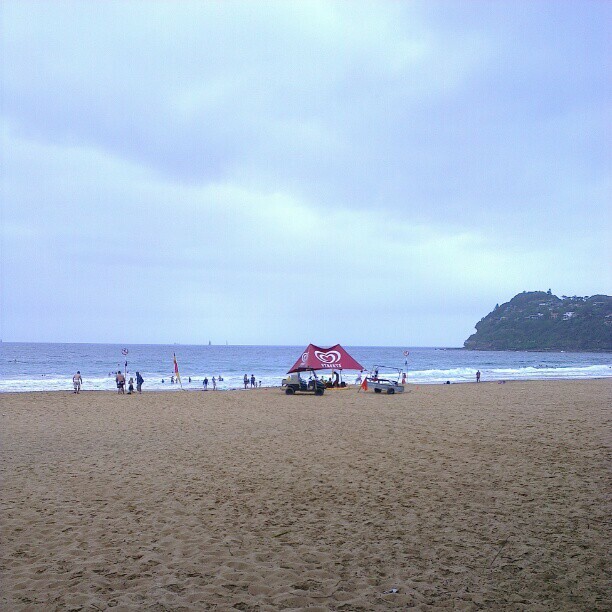 They want to swim, rain, hail or shine so we find ourselves at the beach or pool every single day. I love Sundays the best, because Mr Beach House swims with the kids and I excuse myself for some time alone. The routine is that I use the time, not to swim, but to pound the pavements of whatever beach I find myself. Discovering new bush tracks, new/old cafes and of course there is the real estate. I find it fascinating to see how other people live. 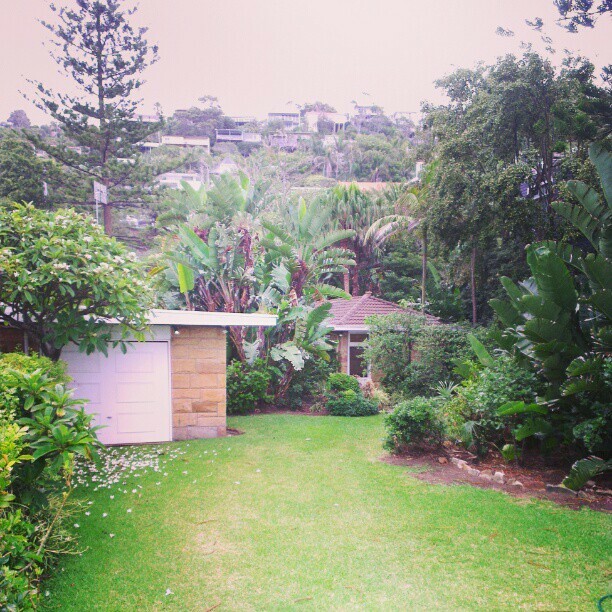 The houses all cling to the hill facing the ocean in varying degrees, so most have pretty amazing views. I often head off on a long walk when it's overcast, because I hate getting sunburnt and it's just more pleasant when it's cooler. I thought the entrance to Carona was lovely. Her northerly view of the beach is even more gorgeous. I also appreciate the under capitalised abodes. 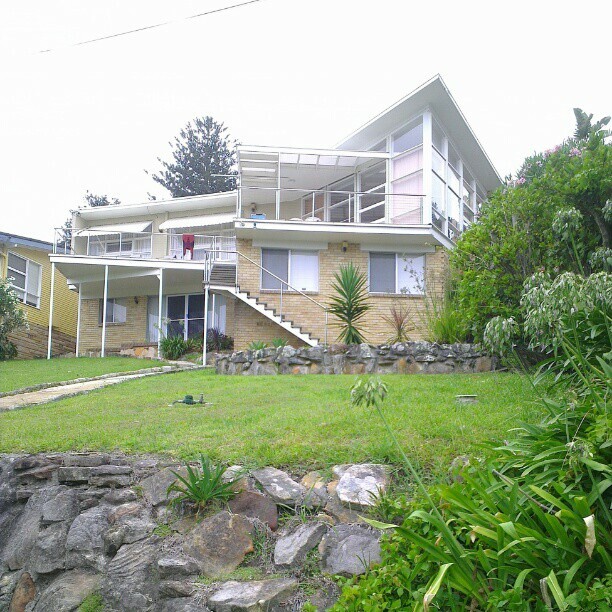 This old P&O style home has seen better days, but oh the potential. I am becoming a big fan of black in decorating. It is uber smart and I love it juxtaposed against all the stone. I love the pavilion to the right of the house too. This mod 60's beach house would be the kind of thing my parents would have loved. It's not for me, but I do love the way the walls come to a peak on the front elevation. 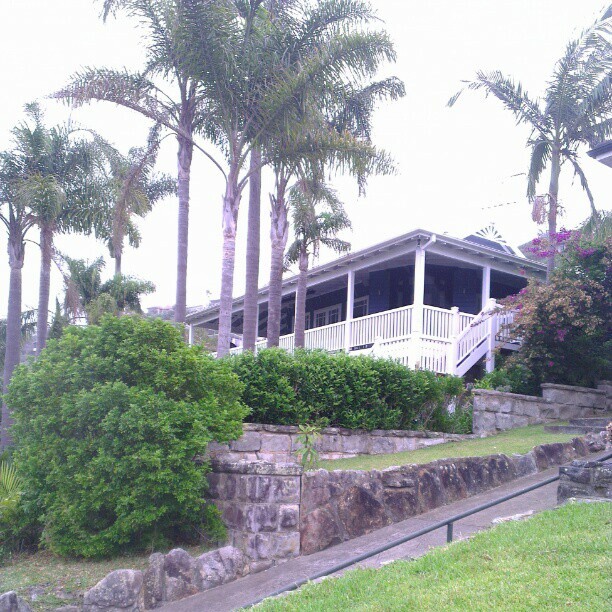 This is where Mr Beach House and I had our wedding reception. It's now called Moby Dicks. 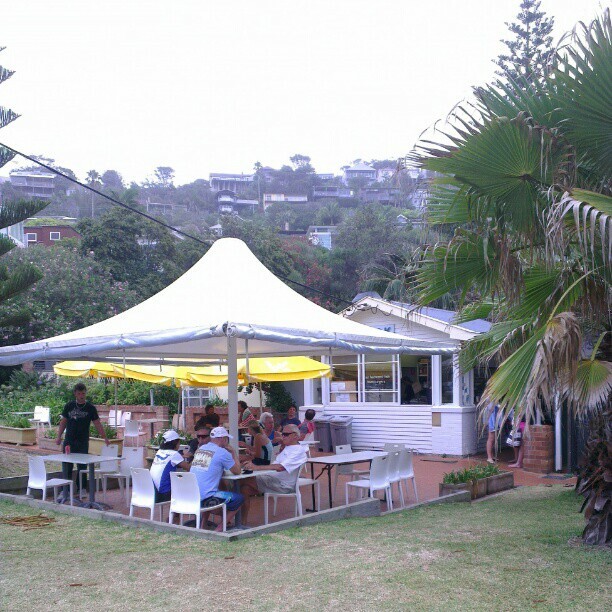 I'm not keen on the name change from the Beach House, but the owners are still the same and the food is superb. 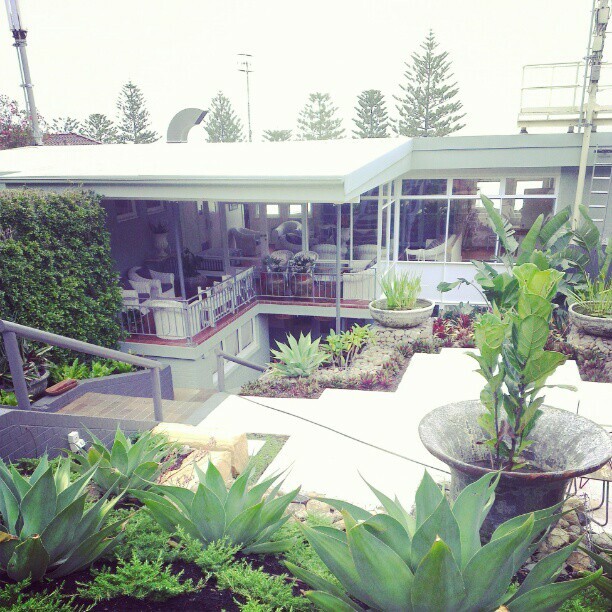 It is above the surf club (top floor) and has panoramic views of Whale Beach. This is Moby Dicks eastern elevation. When we were teenagers it was a night club, but gen X and the baby boomers are all grown up, so now it is a fabulous restaurant. 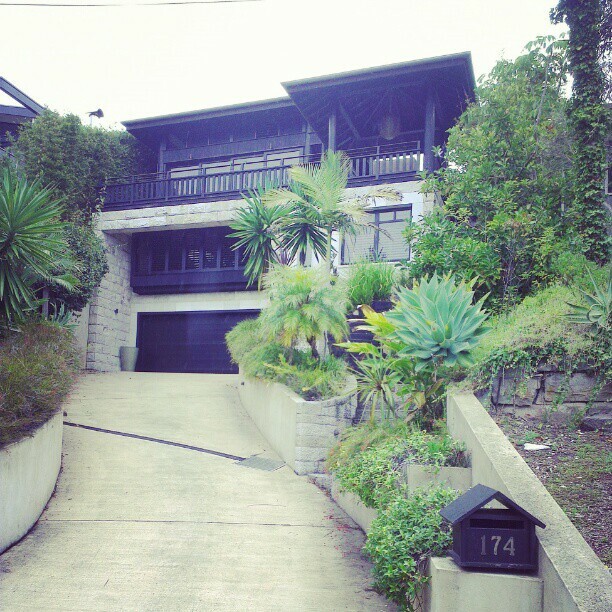 Mr Beach House once saw David Bowie play there in the 1980's. 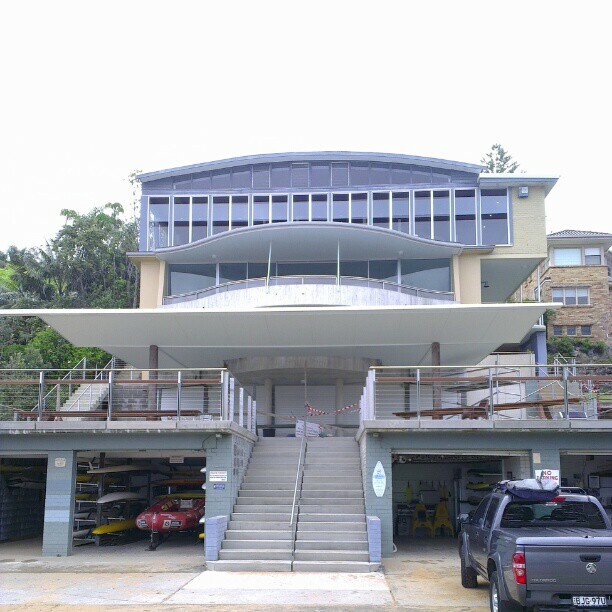 You can see the lower two floors (the surf club) are being upgraded. I made enquires and it will still only be open to members and their guests, but they intend on conducting sausage sizzles for hungry surfers, when it's completed. 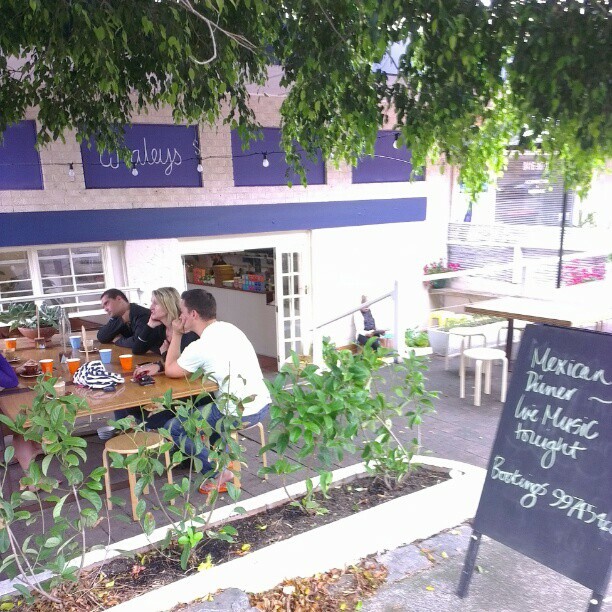 Whaleys cafe is another class act and is just down the road from Moby Dicks on Whale Beach Road. They do breakfast and lunch 7 days and dinner with live music Thursday to Sunday. The menu looks really fresh, with a Mexican bent and we plan to try it this week for dinner. 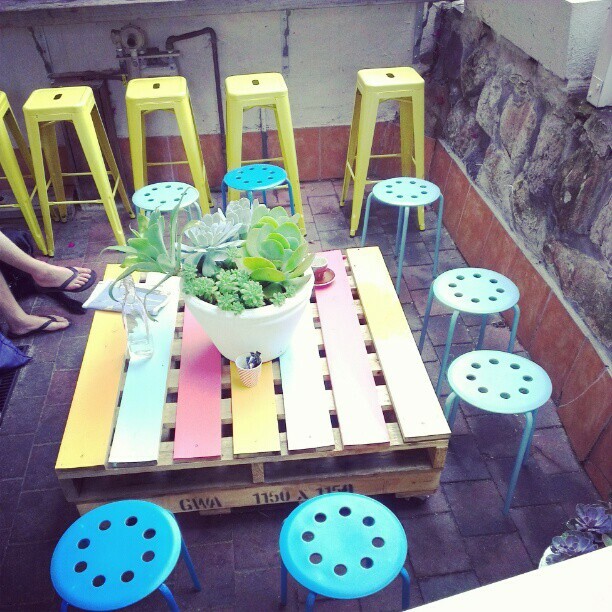 Love the way they have styled their outdoor seating area with colour, succulents and a repurposed pallet as a coffee table. Here is her inside vista. She has a small sea view, but only from select tables. 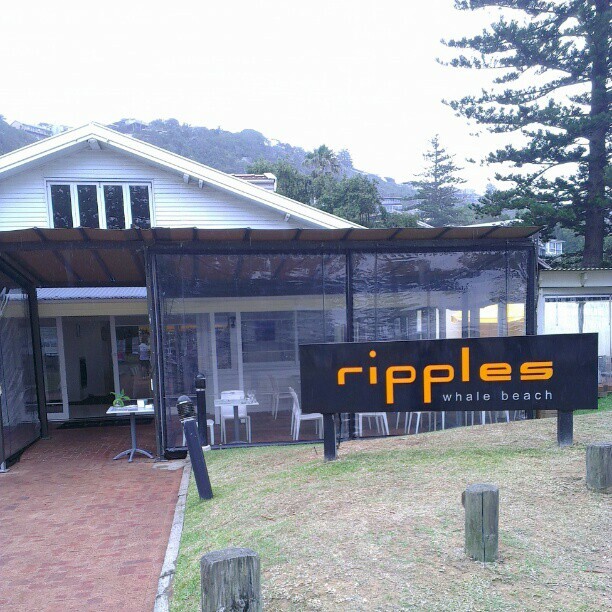 Ripples is right across the road from the beach and is fantastic for lunch, but in the medium to high price range. The food is excellent though. The kiosk next door, was more us today with the kiddos in toe. 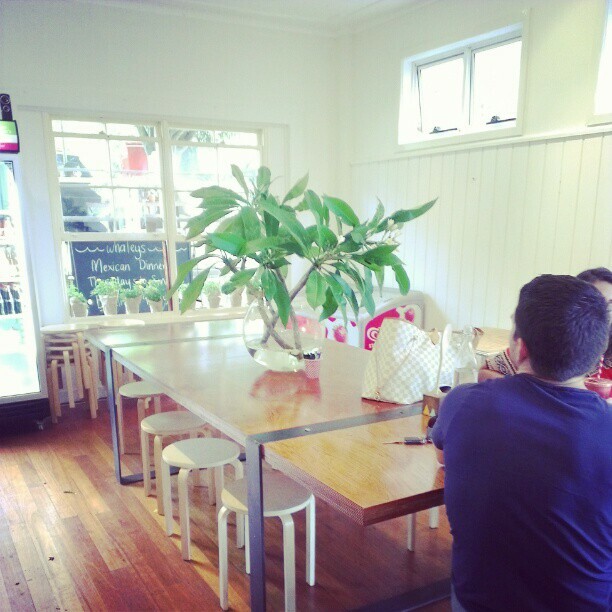 They do great toasties, coffee, fish and chips and burgers. So back to my walk. 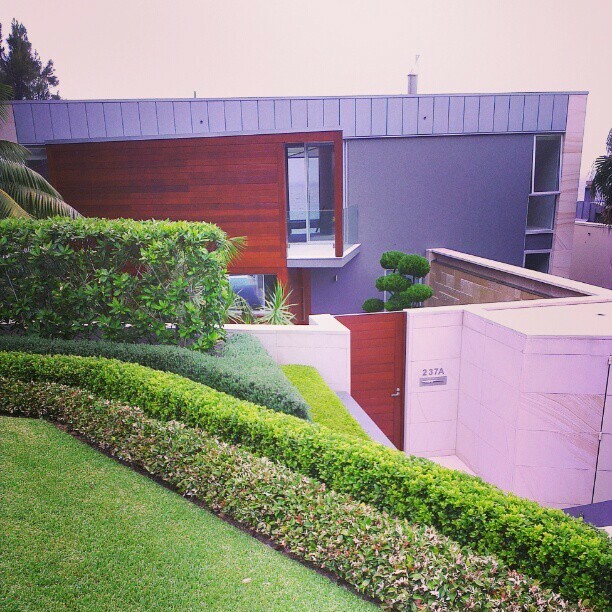 There is no accounting for taste and this boxy style of house is something I just can't warm to. 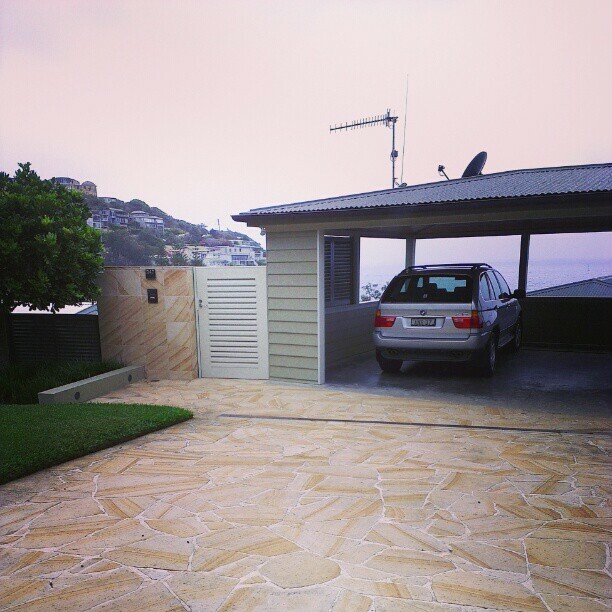 Even the garages have beautiful views in this part of the world. Love the stone work here. I think a lawyer must own this place, in view of the signage. And when the houses on the beach front start to look like office blocks it's time to pull the pin, despite the fact that this area really is stunning and totally worth a day trip if you are in Sydney. So I headed back to the beach to find the family. 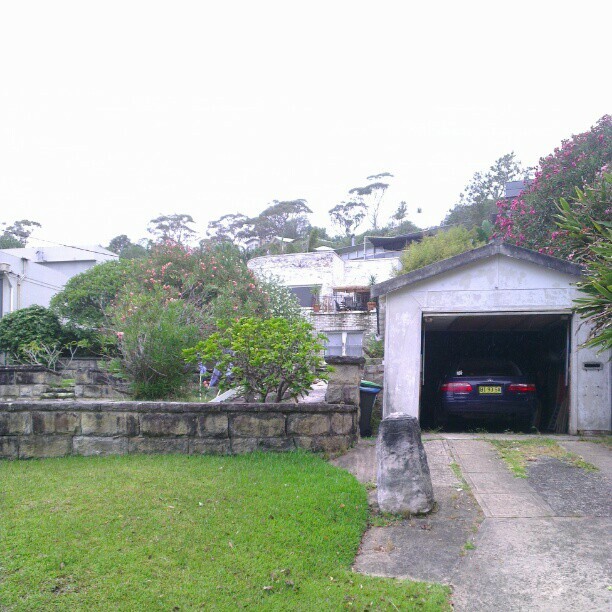 But not before I appreciated the neighbouring house to those soulless 'office blocks'. 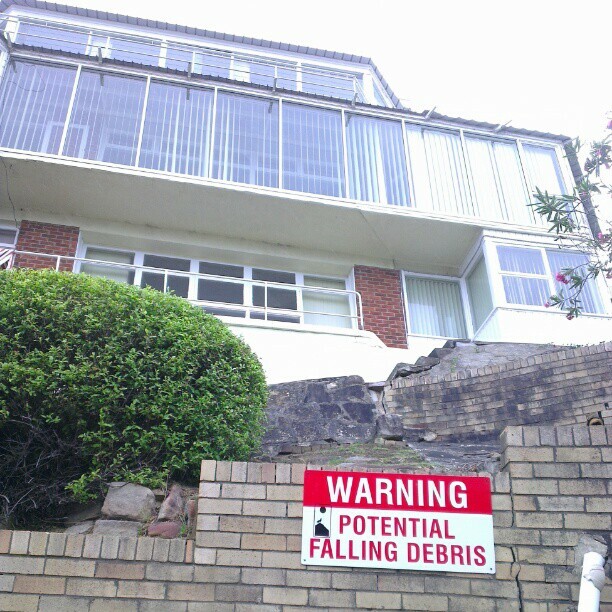 I wonder how long 'til someone knocks this one down and replaces it with a concrete box. I took this final shot below because I felt very happy at the time, having had an hour or so to myself and I wanted to capture it and remember how it felt. It has come to my attention lately that friends are asking themselves "Is this all there is in life? They confess things like "I've got everything I planned on having and I still don't feel happy. Is this my lot? " I worked out long ago that the answer to that is a big yes.....yes it is...It's what you make it and appreciating what you are surrounded by in the moment, is a good start to reaching someway to nirvana. Life is not always rosy, but it is simple little moments like these, sitting under a pine tree in the light drizzle on a cool Summer day in Sydney, knowing that your family are having fun out there together in the surf somewhere, rain, hail or shine. It is a good moment to be savoured and thankful for. I am pretty low maintenance and this did it for me today. 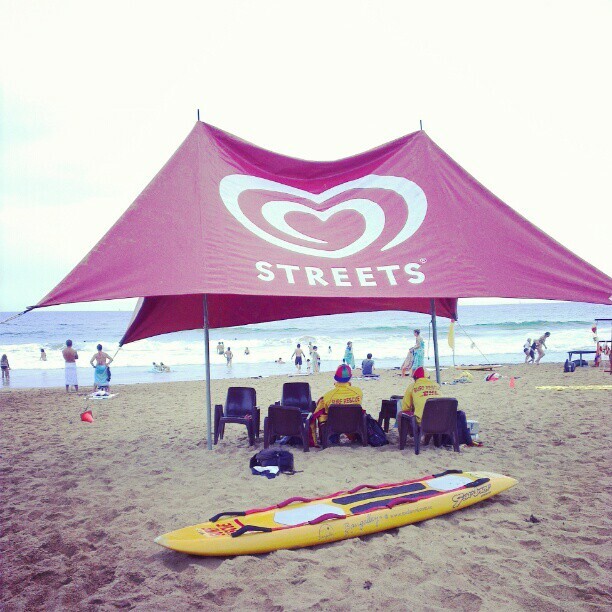 looks like a great place to chillax....how we long for some cool drizzle here! What a glorious spot. I don't think black does it for me, but lots of those houses too. Loved a sneak peek through your lens. Loved this tour today!And your thoughts!AriadnefromGreece! What a lovely post for me to read out in the middle of nsw with no beach in sight! Long ago I used to be a nanny and I worked for quite a few families in Whale and Palm beach so it was great to go on a tour with you. I too love how there are simple cottages nestled among the big houses. But it just goes to show, money doesn't always buy good taste, some are not sympathetic to their surrounds at all. 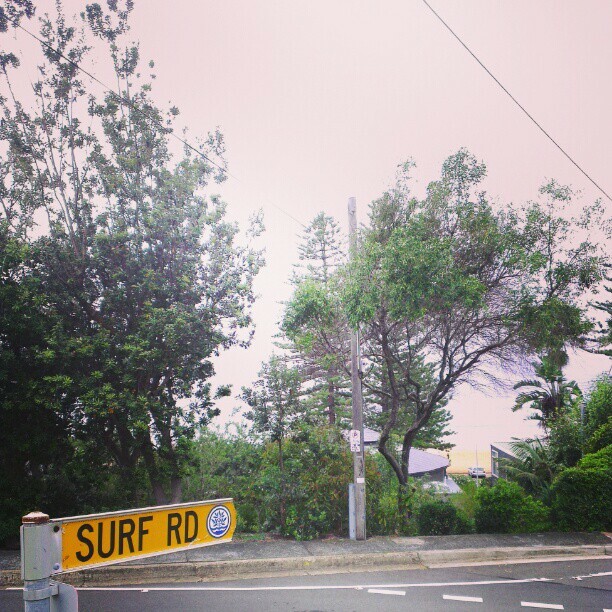 Thanks for a walk down memory lane, wishing I was near the beach right now too. Some lovely real estate that you have shared today! I could definitely enjoy living in a couple! Thanks for the tour Carolyn...some truly gorgeous houses going on there :) And I love the heck out of your last paragraph! Don't you just love it when those moments of complete happiness sneak up on you! I often have them when everyone is home, doing the most mundane of things, and i get this overwhelming feeling of joy (i have been know to get a bit of happiness tears on these occasions). That's when you know life is good and what true happiness is! 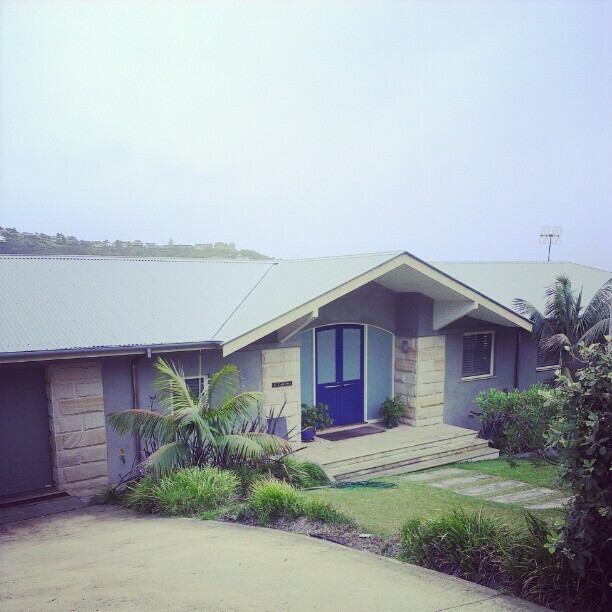 Enjoyed your post...We live in Southern California and Hawaii but rented homes in Whale beach for many years at Christmastime (when it's chilly here) It was fun to see one of our rentals in your blog..the one with black trim...#174. 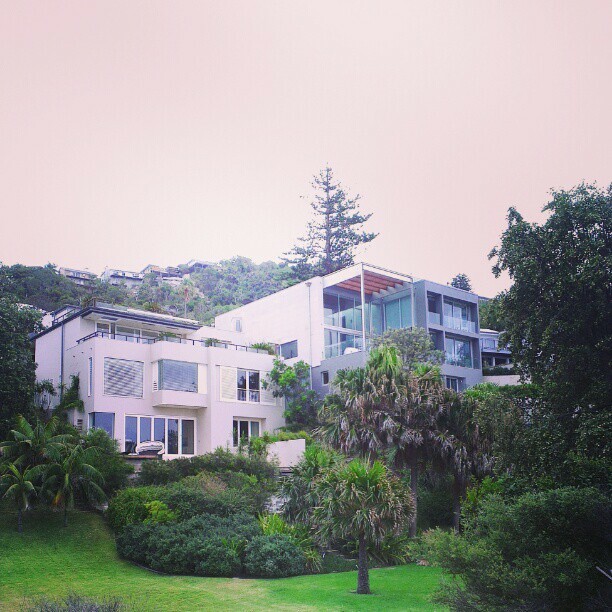 I think it was the first time they'd rented it...beautiful home...fabulous art collection. We were designing our Hawaii house at the time and got some terrific ideas for the house. Think it was designed by a pretty well know local architect. I am a beach girl true and true, grew up in Southern Cal on the coast and even though marriage brought me to Alabama it wasn't too long before we purchased a home on the Alabama Gulf coast. I do exactly what you do with your free time, walk and wander and enjoy the houses and wonder about who lives there...and get mad at the condos and the people who disrespect the nature of the beach life. Thanks for a wonderful tour of a beach in Australia! I love all of the homes. You got some great shots. I have a link party called Wednesdays Adorned From Above Blog Hop and would love to have you share this and any other posts with everyone. It runs from Tuesday night through midnight Sunday. Here is the link to the party. Ah what an incredible beach. 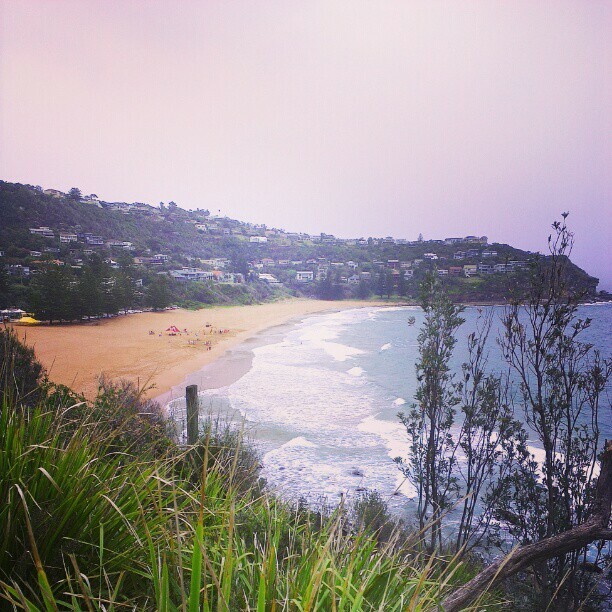 Altho we live away from a coast I am a beach/water person. 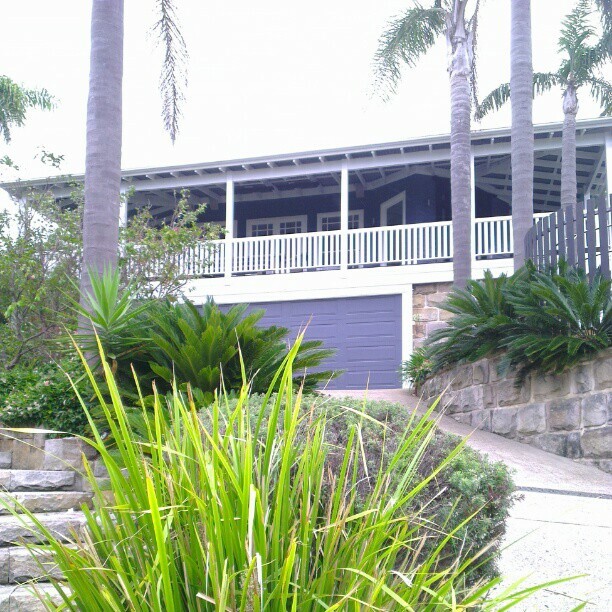 Give me nice little beach cottage and am happy. e do have a state park lake about 7 1/2 miles from our house so that helps for water part at least. The Colorado is about 2 miles south of us but don't get into it, might wash me down to Utah. We lived in San Diego, CA areas for 21 yrs. before we moved to Montana. Every chance I had was at beach altho we lived inland. Kids didn't have to ask to go to beach, I was getting ready before they had chance to ask. Used to take several of kids friends in summer, had great time with all of them. When we moved to Montana lived on big lake on 20 acres, why did we move away? groan. Would go back to Montana if we could have what we did then but hubs says we're too old now. Maybe he is ( will be75 in Oct) but not me, I'm game to go for it,(76 last month.) Think I might be part gypsy, love to go. Smart lady taking time to unwind on your own, too often we don't do that for ourselves. Needed that when all four of mine growing up. Have wonderful weekend.